A-HOTEL.com - Luxury and cheap accommodation in Rakov, Russia. Prices and hotel, apartment booking in Rakov and surrounding. Located in Proletarka, U Iriny Guest House features a garden. The nearest airport is Platov International Airport, 52 km from the guest house. Situated in Proletarka, Domik v derevne features a garden. Free WiFi and a shared kitchen are provided. Apartment Komarova 3k3 is located in Krasnyy Sulin and offers a garden. Guests staying at this apartment have access to a fully equipped kitchen. Set in Proletarka, Отель 888 features air-conditioned rooms with free WiFi. The property provides a 24-hour front desk. Located in Krasnyy Sulin, Cottage on Parkovay features accommodation with a terrace and free WiFi. Guests staying at this holiday home have access to a fully equipped kitchen. Offering free WiFi and garden views, Cottage on Serafimovicha is an accommodation set in Krasnyy Sulin. Guests staying at this holiday home have access to a fully equipped kitchen. Avtomobilistov is located in Krasnyy Sulin. The property features garden views. Offering free WiFi and river views, Apartment Sulinskaya 35 is an accommodation located in Krasnyy Sulin. With city views, this accommodation offers a balcony. Guest House Ayuta is set in Shakhty. The accommodation offers valet parking and free WiFi. Set in Ayutinskiy, Triumph features free WiFi. Boasting a 24-hour front desk, this property also provides guests with a terrace. апартаменты is situated in Shakhty. Guests staying at this apartment have access to a fully equipped kitchenette. квартира посуточно is located in Shakhty. This apartment offers air-conditioned accommodation with free WiFi. Hotel Dio Lakrua is located in Shakhty, 10 km from the city centre. Free WiFi access is available. Featuring free WiFi and a restaurant, Hotel Zamok offers pet-friendly accommodation in Shakhty. Guests can enjoy the on-site private brewery traditional Czech-style beer. Set in Shakhty, Vostok offers a shared lounge. The accommodation provides a 24-hour front desk and free WiFi is available. Gornyak Hotel is offering accommodation in Shakhty. This 2-star hotel offers a 24-hour front desk and an ATM. Featuring a bar and a restaurant, Integral is located in Shakhty. The property provides a 24-hour front desk. Located in the quiet area, just a 20-minute walk from the city centre of Shakhty, Hotel Kuzbass features a garden, air-conditioned rooms and free Wi-Fi. Shakhty Drama Theatre is a 5-minute drive away. 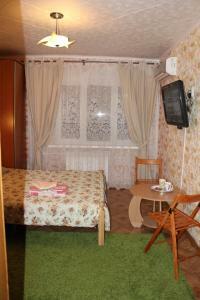 Offering free WiFi and city views, Квартира is an accommodation situated in Novoshakhtinsk. Guests have a private balcony. 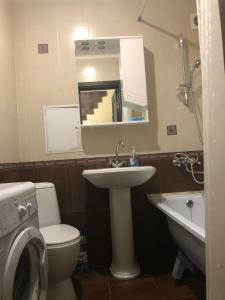 Featuring air-conditioned accommodation with a balcony, Победы Революции 58 б is located in Shakhty. Guests can enjoy the free WiFi.